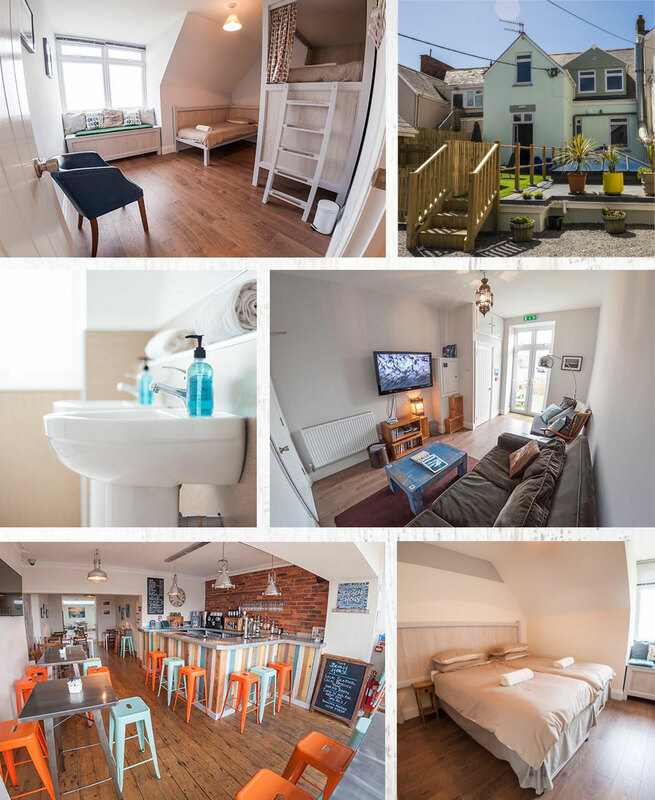 The Beach House Hostel offers a unique, relaxed style of accommodation in the centre of Woolacombe and a 2 minute walk from the beach. The House has a Bistro/Bar on the ground floor and the Hostel above with 3 Private rooms and 3 Dormitory style rooms. On the top floor are the Private rooms. Room 4 is a Twin with amazing Sea Views. Room 5 is larger with amazing Sea Views and can be booked either as a Twin or Triple. Room 6 is also lager and can be booked as a Twin or Triple and is facing the Courtyard. All bedding and towels are provided for all our guests. We have a comfortable shared lounge and terrace where we have tea/coffee and snacks for all our guests in the morning. Sorry but we do not serve breakfast but are happy to let you know where the best places are in the village. We have immaculate shared bathrooms on all the 3 floors including a wet room on the ground floor so you are able to come back from the beach shower straight away and there is a space to store wetsuits and boards safely. Our free car park can hold up to 6 medium size cars, which in the summer months is very handy as there is a charge for all parking in the village. The Bistro and Bar offers lunch and dinner, our menu focuses on using local produce and seafood in a cosy, relaxed environment. Our bar area is a great space to relax and enjoy a local brew, cocktail or lovely glass of wine watching the sunset. Please check out the video below to get a feel for The Beach House Hostel. For one night stay a £10 charge will be added. Additional charge of £35 apply for a 3rd person in rooms 5 and 6. High Season is all UK school holidays and Bank Holiday weekends. We have a 3 nights mandatory stay for all bank holiday weekends and 4 nights for Easter weekend.